Whether we call it Eucharistic Adoration or Holy Hour, the time we spend with the Eucharistic Lord in Adoration offers many graces. Often, however, it is difficult to discern a clear plan of action. We might wonder if we are to wait for inspiration, use some formal format of prayer, or simply sit and wait with Him. Since our parish just welcomed a new pastor priest, we now have a regularly scheduled, once per month evening Mass, Holy Hour, and Confession. As a tiny, rural mission parish this is quite the accomplishment! Yet, like others, I am not always quite sure how to spend my hour with Jesus. Therefore, after a few searches through various Catholic sources, I created a short list of options for my own use. It is important to realize that, as individuals in varying circumstances, we may all have specific differences with this list. My intention is simply to solidify a plan for my analytical self and share it with others as a suggestion. As a visiting priest told us during his homily, simply saying the words, “Come Holy Spirit Come” frequently is a potent invitation for discerning His will. Our pastor recently shared his thoughts that the Holy Spirit is sometimes taken for granted and perhaps even forgotten. We focus so much on God the Father and Jesus the Son and Lord, that we are in danger of skipping the Holy Spirit. Asking Him for His help, then, is an important beginning to Eucharistic Adoration. This sets the tone for the rest of our time with Jesus. Now that we are in tune with the Holy Spirit it is a good time for the Guest of Honor. 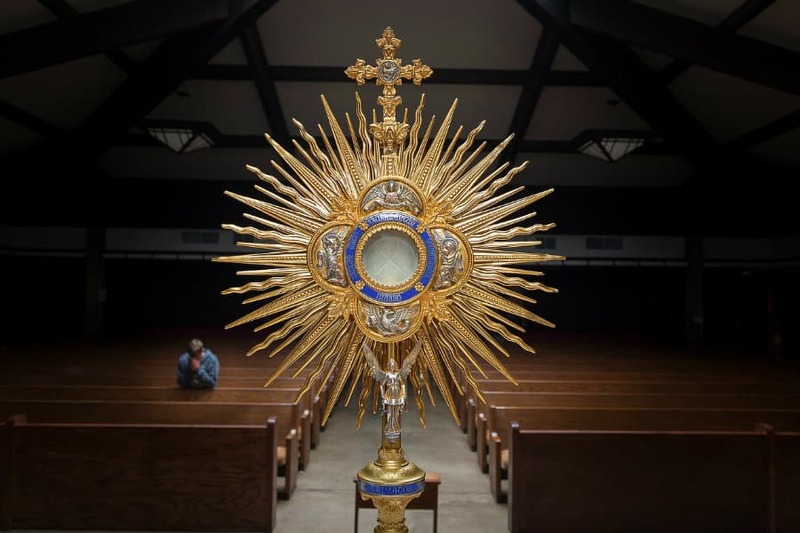 Adore Jesus, in the Monstrance, as He patiently waits and welcomes us. He is the One Who gave His Life for us and our sins. It is He to Whom we owe adoration and worship. Focus on the Divine Presence and the miracle of this great opportunity to do Him homage in a real and tangible visit in His earthly home. Remembering that God gave His only Son as expiation for our sinfulness, we should now consider all of our shortcomings. How we fail Him – every day, almost every minute! Inspired by the Holy Spirit and internally speaking to Him, we can access our poor human abilities and how we fail even them. Meditating during Eucharistic Adoration opens up an entirely new realm for us. There, before us is our Lord. The Holy Spirit is there to whisper inspirational thoughts into our hearts. We are in the Divine Presence and have a direct line of communication open for us. What a gift! Nourished with inspiration from the Holy Spirit and gifted with God the Son’s presence, it is only right and just to offer thanks. Bowing in front of such Kingship, we can now revel in the opportunity this experience offers to our souls. We can note that none of this comes from any obligation on the part of God. He alone created us and gave us free will. That He welcomes us back, wayward children that we are, time and time again is something for which we should be very grateful. The next period is a good time to petition Jesus for our needs and the needs of others. Although He knows our hearts, talking to Him like an intimate friend, it is a special exchange to internally verbalize our needs and desires. The answers will most certainly come in His time but, asking is a special time of bonding, faith, and hope. It also helps us to solidify the wisdom and specifics of our petitions. As we come to the conclusion of our hour of Eucharistic Adoration, we are offered the perfect time to ponder our future actions. How have we failed? What can we do to improve our lives? By now, the Holy Spirit has most likely helped us draw some conclusions. As we prepare to take our leave, we should resolve to act more faithfully. In our parish we begin with the Holy Sacrifice of the Mass. Next comes exposition, prayers, and readings. During Eucharistic Adoration, our priest offers Confession. We conclude with the Benediction. In participating in Mass and then a Holy Hour during which Confession is offered, the time seems to fly by. A visit with Jesus is like a visit with an enduring Friend. Before you know it, the time to go home has arrived. Yet this visit fortifies like no other. As we all strive to become saints, this is an opportunity not to be missed!